Alpine Activities - Getting ready for your snow experience. Watch the following Bogong youtube videos. They will give you a good idea of the types of experiences you are likely to have while on your visit. For beginners riding a chairlift can be daunting. Watching the chairlift video will heap ease your mind and prepare you for the experience. What worries you most about your time on the snow? Snowsports activities can be hard work and at times high impact on your body. Physical activity in extreme environments and at altitude will require greater levels of fitness than your average training or exercise session. Being physically prepared for such activities will significantly increase your enjoyment and signtificantly decrease your risk of injury or illness. It is a great idea to start considering a training regime that will support your visit to Bogong. You may like to team up with a couple of friends and start a lunchtime training program or alternatively add some simple training to your everyday routine such as a 30 minute brisk walk or run. When developing a training regime you should remember to start small and work up. Always remember to warm up and stretch and try to make your training regular (at least three times per week). 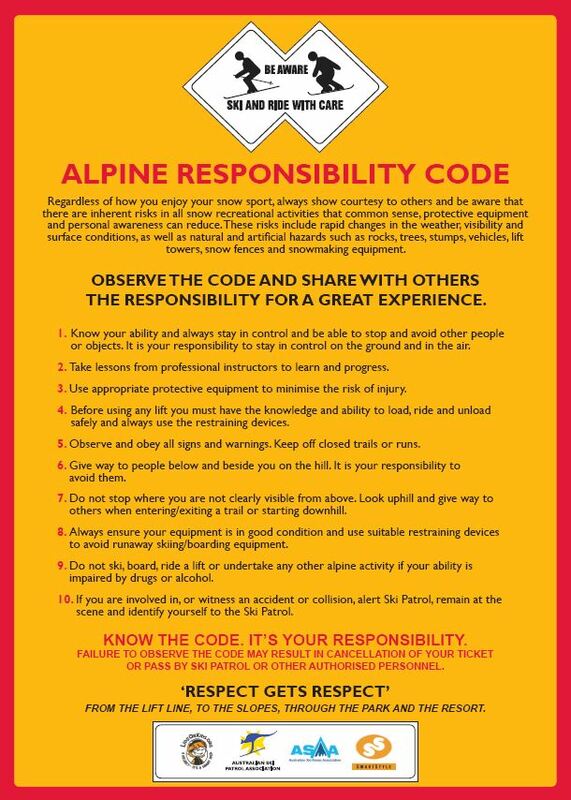 The Alpine responsibility code is all about safe, responsible and respectful behaviours and attitudes that allo all snow users to enjoy their experience. Look carefully over the Alpine Responsibility Code.Task:What could be a possible consequence of not sticking to the Alpine Responsibility Code?How could this impact on your experience or the experience of those with you?Visit and explore the SnowSafe website, then complete the following tasks.Task:Identify four clothing considerations when in the alpine environment.Create a shopping list of things you could search for at your local op-shop that might make you more comfortable in the snow. Hypothermia is a real risk in the alpine environment and it is important that you understand it and know how to prevent it. What is hypothermia, what are the symptoms and how can you avoid it?